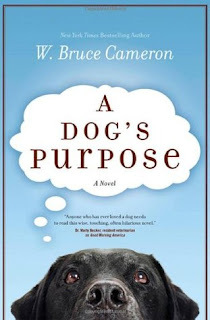 Heartwarming, insightful, and often laugh out loud funny, this book is not only the emotional and hilarious story of a dog's many lives, but also a dog's eye commentary on human relationships and the unbreakable bonds between man and man's best friend. This story teaches us that love never dies, that our true friends are always with us, and that every creature on earth is born with a purpose. I gave this book 5 stars. It's only February and I can already tell that this is going to be one of my favourite books of the year, maybe even my number one favourite. While reading this book I realized that I was not emotionally stable enough to read it. If you are a dog lover, read it. If you are not a dog lover, still read it. I think this book replaces The Green Mile for the book that made me cry the most. I cried during most of the book. Every time there was a new reincarnation of this dog I started crying again. Near the end of the book, during the last few pages I was sobbing so hard that it took me about ten minutes to read 4 pages. Usually when I'm reading a book my problem is that I don't care enough about the characters, but my problem during this book is that the dog was such a good boy/girl. Too good for me. I cared too much. Now I decided to make this spoiler free because I honestly think that it's better to go into this without knowing much besides the synopsis. Honestly, you will be so emotionally invested int his book and the story that any problems it may have had just don't bother you. I don't think I noticed any problems in it, so basically it's the perfect book. I have to say that the long term Ethan plot line was definitely my favourite. Ethan was his boy. Ethan was the one Bailey always wanted to get back to. I'm getting really emotional right now just thinking about it and I need to stop right now so that I don't start sobbing or get into huge spoilers of the book.